The kit includes two filters. The new compact AirDog™ PF 150 "filteration system" provides the most effective technology designed specifically for diesel powered pickups, SUVs and other Cummins engines to remove water, particulates, vapor and entrained air from diesel fuel. The AirDog™ PF-150 replaces the Cummins factory lift pump and filter system, and enhances the fuel delivery of the Powerstroke and Duramax with a commercial duty system. Your highly modified engine demands higher fuel flows. 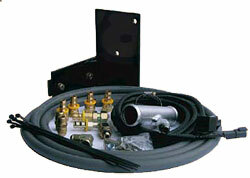 Yet, high fuel flows increase agitation in the fuel tank and fuel temperatures, producing cavitation at the lift pump. These factors generate additional air/vapor in the fuel system, preventing your engine from performing the way it was designed to function. 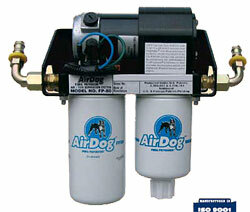 The AirDog™ eliminates the air in the fuel that robs your engine of consistently greater performance, and provides the fuel pressures and flows you need to feed your engine to produce maximum performance and power output. • For Stock and Highly Modified Engines! Stratapore™ is a registered trademark of the Fleetguard corporation. 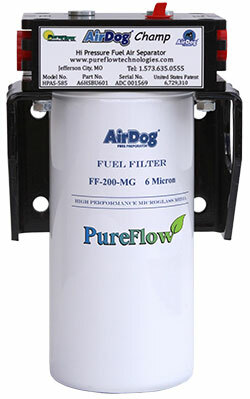 The AirDog™ provides the proper pressure/flow of fuel to your diesel engine under virtually all operating conditions for PEAK EFFICIENCY with CONSISTENT and MAXIMUM POWER OUTPUT!